Still using the low density low speed Flash Drive with only limited protection? You may want to try our new X-Wall® XO -192U TDES 192-bit hardware encrypted 1" 8GB USB drive. Engineered for users who need quick access to extra storage but don't want to carry around a full-size enclosure, the new 1" 8GB USB2.0 hard drive delivers impressive storage capacity at blazing fast data transfer speed, superior impact resistance and hardware encryption security all in a tiny sleek package. Enova® X-Wall® XO -192U safeguards entire 8GB volume via NIST/CSE certified TDES 192-bit hardware cryptographic engine. Alternative encryption strength such as DES 64-bit and/or TDES 128-bit can be obtained via swapping the appropriate X-Wall® XO and cryptographic key length that is stored in the Key Token. Unlike software-based encryption solutions, hardware based encryption offers multiple levels of protection with real-time performance. As the entire drive volume is secured with TDES hardware cryptographic engine, there is no exception that data could be left unprotected. Combined with the Key Token, a physical key that contains the "Cryptographic Key" necessary for activating X-Wall® XO cryptographic engine, the new encrypted 1" 8GB USB drive provides unsurpassed security for your private and sensitive data. The 1" 8GB USB drive must be firstly partitioned and formatted using the provided paired Key Token as the partition table, FAT (File Allocation Table), and data will be associated with the unique Cryptographic Key that is stored in the pair of the Key Token. Continuous usage of the drive does not require a repetitive partition or format. Simply plug in the Key Token at power up (it is when the enclosed USB cable is plugged into the Host USB port) and wait for the drive to be properly recognized and configured by the Host computer. The Key Token can then be safely removed and deposited after the host has properly recognized and configured. Your paired Key Token stores the Cryptographic Key required to activate the X-Wall® XO cryptographic engine. The wrong key token will render the entire content of the 1" USB drive illegible (as the decryption process will be incorrect thus the drive content becomes illegible). Always safeguard your Key Token and keep it separately from the 1" USB drive. The X-Wall® XO -192U offers real-time transparent cryptographic operation at more than 1.1Gbit/sec (133MB/sec and more), which out-performs a standard 480Mbit/sec (60MB/sec) USB2.0 performance. As a result, your 1" 8GB USB drive is operating at the speed limitation of the USB2.0 transfer rather than that of the X-Wall® XO. A modern USB drive design can usually accomplish Ultra DMA mode 4 transfer at 66MB/sec and that's the speed X-Wall® XO will be operating. X-Wall® XO can also accommodate the performance of the USB drive design and can be adjusted down accordingly. As a result, the performance of the 1" USB 8GB drive, with the TDES 192-bit cryptographic strength, is not degraded. Your paired Key Tokens are pre-programmed with randomized Cryptographic Key codes. To create, distribute, manage, recover the Cryptographic Key (Key Token), use Enova Technology Hawk-IIc Key Management Platform. The said platform offers a complete hardware and software utilities to facilitate the entire key management procedure. With the help from the platform, you will be able to generate (yes, to discard the original Cryptographic key codes and to generate as many new ones as you want), maintain, and distribute the new Cryptographic keys. Best, to recover the actual key codes when the available Key Tokens are all lost or damaged. Compared with the regular slow and perhaps unreliable flash drive, you will notice a significant price deduction while performance and security are greatly enhanced. 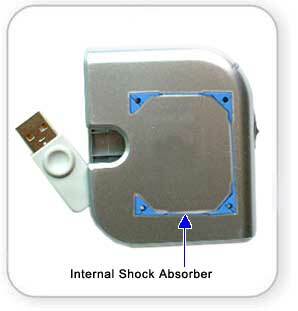 The innovative internal shock absorber protects your hard drive against accidental drop, bump, and violent motion. The bundled synchronization software allows you to sync with the host to frequent data update without extra hassle. The USB cable is hidden within the unit via specifically engineered cabinet, which saves you lots of trouble searching for the easily lost cable. - USB Mass Storage Class offers driverless installation under Windows XP, 2000 and ME. To operate HDD enclosure via USB2.0 in MAC, Mac OS X 10.3, or 10.1.5/10.2.x with USB 2.0 driver installed is required to support high speed USB2.0. Mac OS 9.x supports full speed only. Mac OS supports USB 2.0 driver since Mac OS X 10.2.8. Data Watch Technologies Co., Ltd.
© Copyright 2012 Enova Technology Corporation. All Rights Reserved.